Parkers ran a Nissan Micra in Tekna trim to see how this honest small car works in the real world with premium equipment. Our designer Peter Allen put it through its paces around the UK. This freshly relaunched supermini has undergone a radical reinvention. In recent years it’s lagged behind the competition with it’s cheap and cheerful outlook. Now Nissan has launched a car that is visibly larger than it’s predecessor and considerably sharper-looking too. 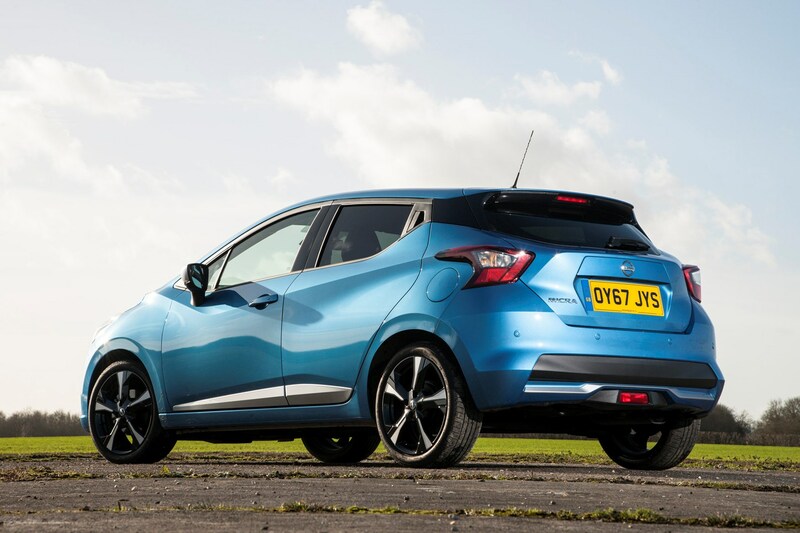 Can it mix it with the best in this very competitive supermini market? 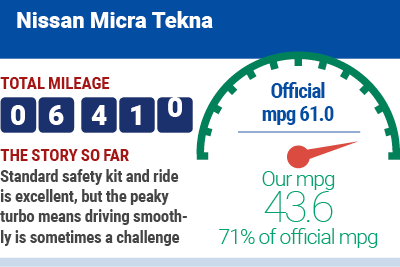 We’ll be pushing our Micra to the limit in the coming months to see how it shapes up. So, which one did we plump for? We’ve gone for the Tekna grade sitting at the very top of the range. At an eye watering £17,835 it’s not cheap, but the spec list is mind-bogglingly long, especially for a car of this size. Highlights include 7.0-inch touchscreen infotainment system, a Bose sound system with six speakers, two of which are in the drivers headrest, a rear-view camera, 17-inch wheels and electrically folding heated door mirrors. Our car also comes with a Vision+ pack that adds Moving Object Detection and Intelligent Blind Spot Intervention for £600. Finally, we’ve added the £550 Vibrant Chrome exterior pack that sports extra metallic flourishes around the bodywork with black and chrome wheels. Combined with the £575 Power Blue metallic paint I was convinced we had a strikingly individual car. That is until the very next day when the first other new Micra I saw on the road was a car of identical colour and specification, right down to the same natty chrome-capped door mirrors. This Tekna is equipped with the 90hp three-cylinder turbo engine. What’s most noticeable is how refined it feels with no hint of the loud thrum found in some three-cylinder units. Power delivery though is not completely linear. The turbo is most active in lower to mid range revs after which it loses interest. That means early gear changes are needed if you want to make rapid progress. Once I got used to this driving mindset, after a day or two, I really enjoyed going through the gears on my usual A- and B-road commute. Body-roll is impressively minimal and the ride is surprisingly cultured, even with 17-inch wheels and the low profile tyres. Bump absorption is particularly admirable considering the hammering my choppy B-road journey subjects the car to. Over the coming months we’re planning a couple of longer journeys. It’ll be a perfect excuse to test the car in motorway conditions and give that Blind Spot Prevention a good work out. I’ve been checking out the extensive list of options and technology on our Tekna model; there’s a lot to discover but here’s a few to start with. or included as standard on our Tekna. This consists of 4 speakers located in the front doors and A-pillars and another two built into either side of the driver’s headrest. 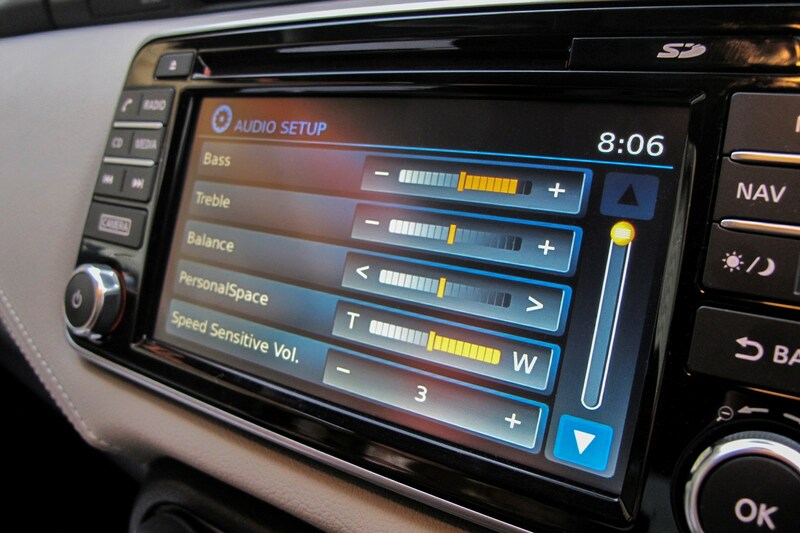 The sound can be adjusted to fill the whole car or, to varying degrees, concentrated on just the driver. I’ve had this set with full emphasis on me from the start and this is where the headrest embedded speakers really come into their own. The sound is truly immersive. It feels as if I’m on stage with the band when listening to my favorite music. The mid-range is particularly impressive, I can hear new detail in songs that I’ve been listening to for years. My last car had a much more expensive Bose system with a traditional meaty sub-woofer located in the boot. I think the Micra’s system comes pretty close to my previous top end kit, perhaps not in depth and power, but certainly in clarity and overall 360° sound. 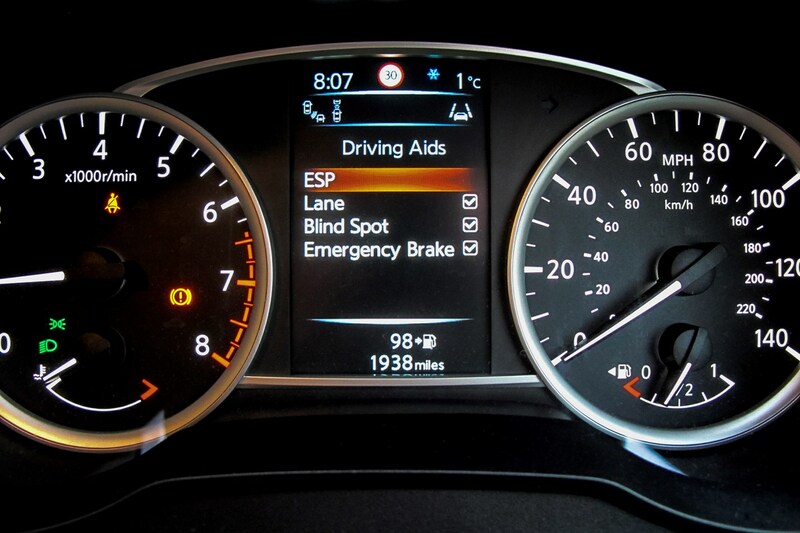 The second piece of technology to be given a workout is the Intelligent Emergency Braking system. This had occasionally beeped at me when drawing near stationary or slowing cars in front of me. The system obviously thought I was approaching the cars too quickly for it’s liking but I felt I was still in control and as I slowed further the beeping would stop. I was even beginning to think it was getting slightly annoying. That was until one evening I momentary took my eye off the road to look at the centre touchscreen. At exactly the same time the traffic in front of me braked suddenly. As I looked up, the system was beeping and already applying the brakes. I was confident my own reactions would have been quick enough to stop the car in time but it would have been close. The technology had reacted much more rapidly than I ever could have. The braking was hard but controlled and I ended up coming to a stop some distance from the car in front of me. I’m hoping that’s the last time I engage this technology in full but it certainly has given me extra piece of mind when driving in heavier traffic. The feature is programmed to recognise pedestrians too and is standard across the entire range. 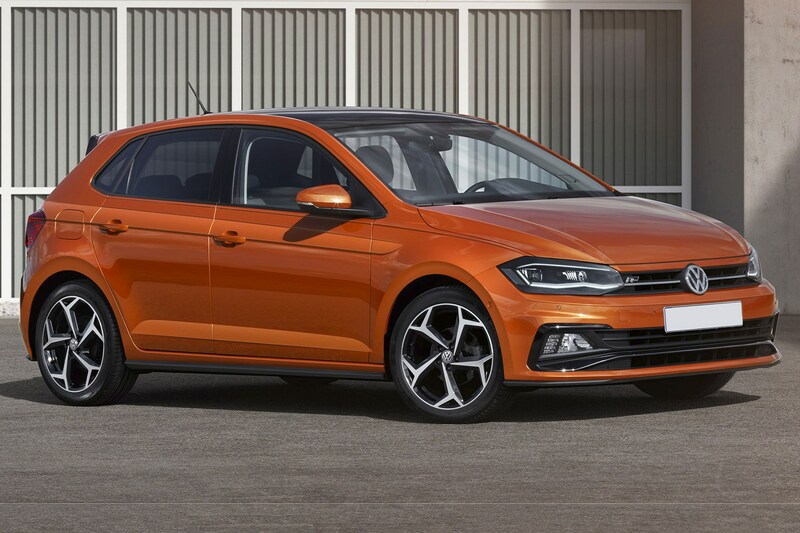 That sounds impressive but this kind of driver safety aide is fast becoming the norm, even in the supermini sector; Volkswagen and SEAT offer similar systems as standard right across their Polo and Ibiza ranges. Fuel economy so far is 46.2mpg. A sound real world figure but my usual commute does involve a lot of medium paced fuel efficient friendly A-roads. I was expecting something a little higher. A few longer excursions are planned in the next couple of weeks so it’ll be interesting to see what happens to those figures. The Micra hit the motorway this week and racked up its first couple of longer journeys. The supermini felt at home on the M11 and pulled off a good impression of a bigger more grown up car. The seats and ride were comfortable enough for our non-stop three hour drive. Road noise at 70mph was a little louder than I expected but that’s only because it’s so quiet and well insulated at lower speeds. The road noise also exposed the lack of a subwoofer on the otherwise excellent Bose sound system, as some lower frequencies were drowned out. On the motorway the Blind Spot Warning system occasionally beeped away reminding me that I perhaps don’t give other cars enough room when pulling out. The radar sensors installed in the rear bumper activate a flashing light in either wing mirror and an audible warning sound when a vehicle is in an adjacent lane. The system seemed to disagree with what I was considered a safe distance to pull into another lane already occupied. Although by the end of the journey, I did find myself giving other cars more room, not wanting to trigger anymore beeping. The upside I suppose was the system was improving my driving. At our destination we picked up friends, and spent the day zipping around London with a full quota of occupants. 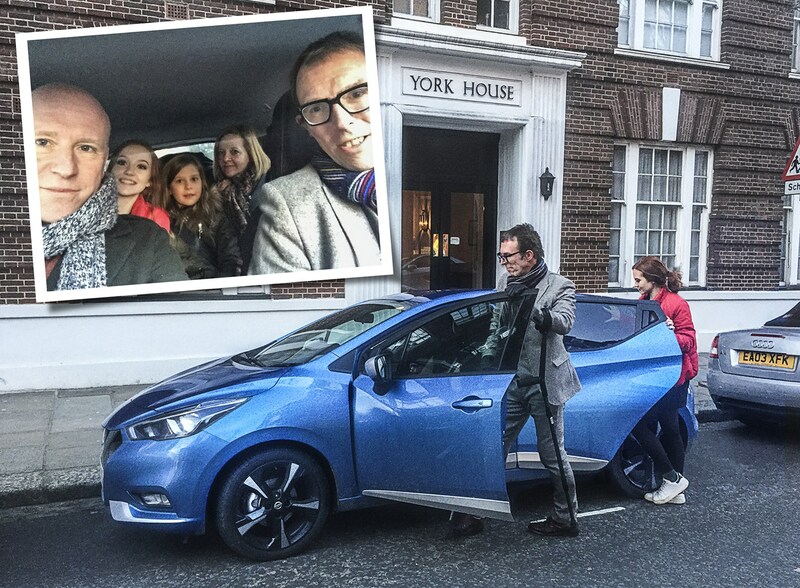 Even with four adults and a child the Micra pulled away without much loss in performance. It was predictably a tight squeeze for my three back seat passengers, but not unbearable for the shorter journeys we were undertaking. Luckily they weren’t tall enough to trouble the lack of rear headroom - a gripe that’s been levelled at the new Micra. With so much city driving, it was inevitable the pedestrian detection element of the Intelligent Braking System would be called into action. It impressively spotted two people about to step into the road. They stopped dead in their tracks as I approached, but the system had already alerted me and my foot was already hovering over the brake pedal. Later, rolling up to a junction the car failed to spot another pedestrian crossing the road that was momentary hidden from my view by the cars A-pillar. My speed was low enough to react in plenty of time, but I thought it was surprising the car hadn’t spotted this more obvious example of pedestrian danger. A supermini should be the perfect city car, small, nimble and nippy and while the Micra has all those qualities in abundance, what prevents it from attaining city car perfection is it’s power delivery. The engine's peaky turbo makes it very hard to drive smoothly when pulling away. Under acceleration the engine sometimes suffers from old-fashioned turbo lag, as you are left waiting for something to happen. Other times the turbo is already spinning and propelling you at a greater acceleration than is needed. This means you have to quickly back off, and experience a slight kangaroo hop as your revs adjust. I spent the day driving in London trying to master the art of pulling away smoothly, but I left the capital that evening very much defeated. It was the usual chaotic scene; unloading the car of kids and shopping, but on this occasion I somehow walked away from the car with the lights on. How I missed the warning sounds I’m not sure, as they’re definitely loud enough. Perhaps my kids are just louder. I had the lights set to auto since taking delivery of the car, so I must’ve knocked them onto full whilst fumbling for the rear window wiper (same style of switch, but on the opposite stalk). Returning to the Micra five hours later the battery was very dead. 'No problem' I thought, as I dug the jump leads out from the garage - but after following the instructions carefully, nothing was starting. I tried a battery charger but again, no joy. Confused, I admitted defeat and rang the Nissan Pan-European Roadside Assistance number. All new Nissans come with cover for the first three years or 60,000 miles. The service is operated by the RAC, and they had a technician with me within twenty minutes, not bad for a Sunday evening in rural Lincolnshire. The RAC technician explained that the high capacity batteries used in all start/stop systems require top spec jump leads or chargers, evidently I had neither. My embarassment faded with this news, at least. With his pro equipment he started the car first time and suggested running it for at least an hour, as in his words ‘these batteries take forever to charge’. 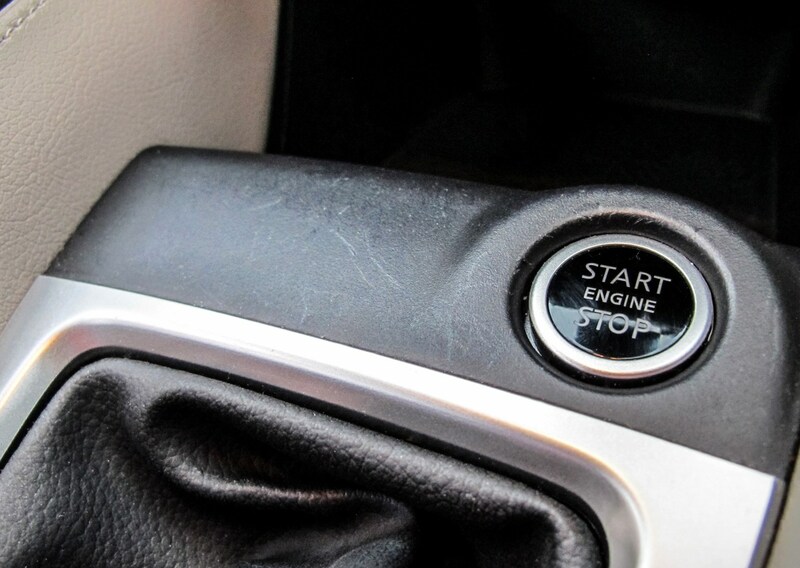 Stop/start technology is standard on all models of Micra apart from the entry level Visia grade. it's a refined system, with a very rapid response time from stop to start, unlike other systems I’ve encountered. It will even display an estimate of how many Kgs of CO2 you’re saving while the car is at a standstill. Nice touch! Then the snow arrived. The Micra covered plenty of miles in varying degrees of snow and ice. Being front wheel drive and a relatively light, small car it coped well. It was just the power delivery that let it down. Even trying to pull away gently in second to get as much traction as possible got the front wheels spinning furiously. The turbo made balancing the power very difficult indeed. After all that drama I’m looking forward to some straightforward motoring in the coming weeks. 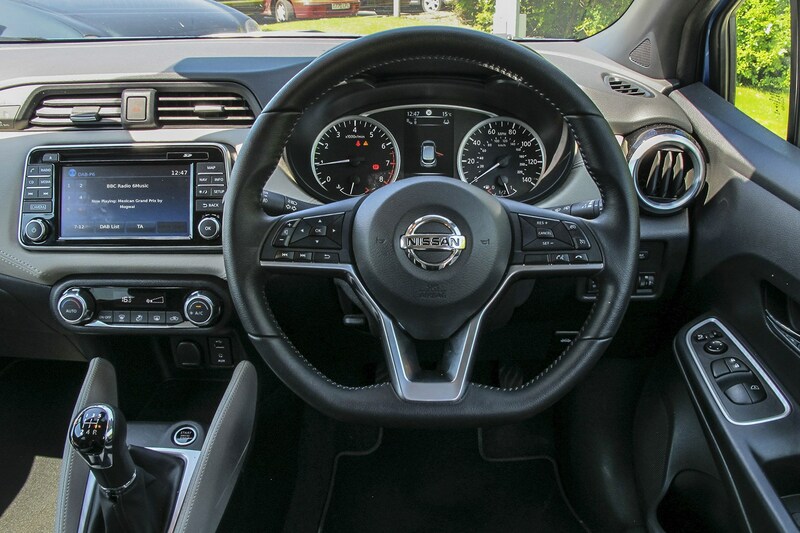 The Nissan Micra Tekna has what seems like a never-ending list of gadgets and options, but the latest feature to come under the spotlight I actually found by accident. A couple of times I went to turn my headlights to full beam and nothing happened. I consulted the manual and to my surprise, there’s another clever little piece of tech Nissan calls High Beam Assist. It’s a camera (just in front of the rear view mirror) controlled assistant which changes from high to low beam automatically when it senses traffic ahead. If you set the lights to auto and are travelling over 15mph the system is activated. When I first read about the feature, which is standard across the whole range, I was somewhat sceptical about its ability. If it turned out to be a half-baked and gimmicky system not worth using I would have to turn the headlights off auto every time just to dip my lights manually. I cover plenty of rural miles, making it easy to fully test the technology. To my surprise it works extremely well. What really struck me was the level of intelligence the system appeared to use. It seems to be able to consistently distinguish between car lights, street lighting and other light sources. 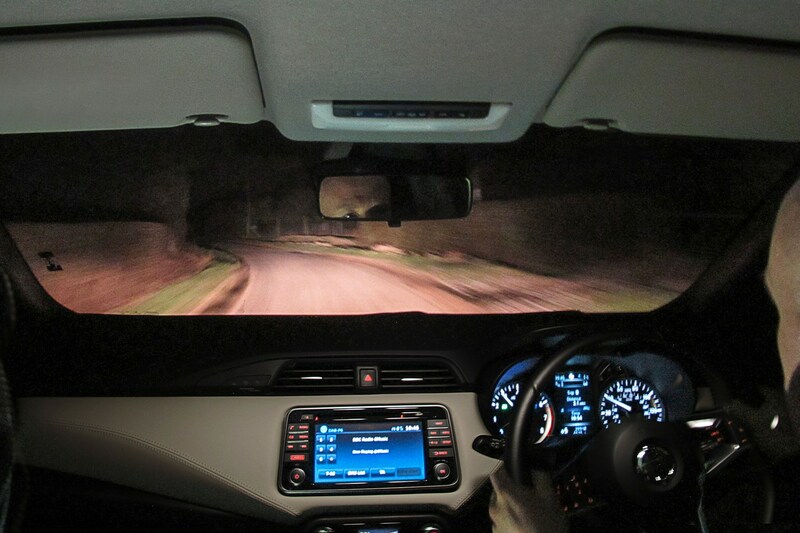 The result being the headlights are dipped when any car lights are detected, even if they’re way off in the distance and yet the lights won’t dip with any street lighting until you travel directly underneath them. The system then identifies that there’s enough light to employ low beam. It’s a seamless experience and I must admit to occasionally taking a longer, darker way home just to marvel at the technology working faultlessly. 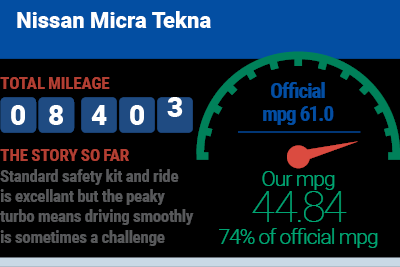 The Micra has now been in my care for just over two months and in that time I’ve covered a healthy 4,000 miles. Economy is consistently in the early to mid forties, and I can’t see it changing much in the future unless my car use changes radically. I can’t help feel a little disappointed by those figures. I consider myself an average type of driver, not prone to flooring the accelerator and my typical of journey is nothing too taxing. 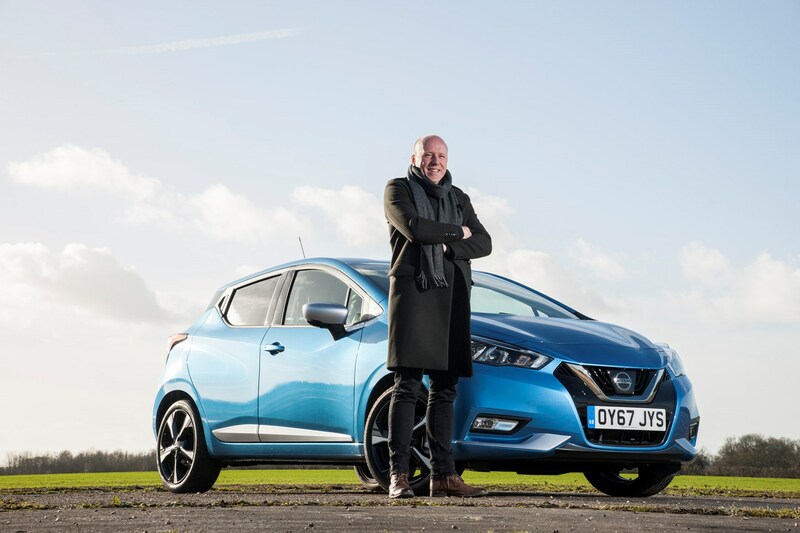 The figures I’ve been seeing are roughly seventy percent of the numbers claimed by Nissan (61mpg), that about on par with the rest of the Parkers long-term test fleet where most cars are returning two-thirds of what manufacturers claim. I thought I’d address a couple of the most popular comments from other people about the Micra. Firstly and by far the most favoured observation I’ve encountered is ‘it’s a bigger car than they expected’. This is because it is a big car, compared to the last generation Micra at least; it’s now 174mm longer and 78mm wider. It ’s also 55mm lower, which probably adds to the impression of it being a sleeker, bigger car. So why did Nissan decide to beef up the smallest car in it’s line up? Well, the new fifth generation car is replacing two models, not just the fourth generation Micra but also the slightly larger Nissan Note, which is now only being sold in Asia and the Americas. Another reason must be the need to keep up with the competition. Most of the Micra’s rivals have also ballooned in size - to such an extent that even with the Micra’s new found girth it’s still one of the smaller cars in the sector. It is a testament to Nissan’s expertise in styling and packaging that it looks bigger than the new Ford Fiesta when in fact it’s actually slightly smaller in width and length. Perhaps it’s that lower roofline, the rakish windscreen or the thick-set haunches that creates this illusion. Incidentally, the windscreen is so raked that the sun visors are extra large to cope with the amount of glass that needs protecting from sun glare. They’re the biggest I’ve seen in any car. Previously I've talked about how not only does it look a big car, it feels and drives like one too - but there are a few things that betray that big car feel. Nowhere in the range do you get electric rear windows, not even in our top of the range Tekna trim, unlike rivals like the Polo and Fiesta. Also the sound deadening around the wheel arches is pretty basic. Anytime you drive over loose gravel it sounds like someone’s dropped some marbles in an empty bath. Then there’s the rather primitive automatic air conditioning. 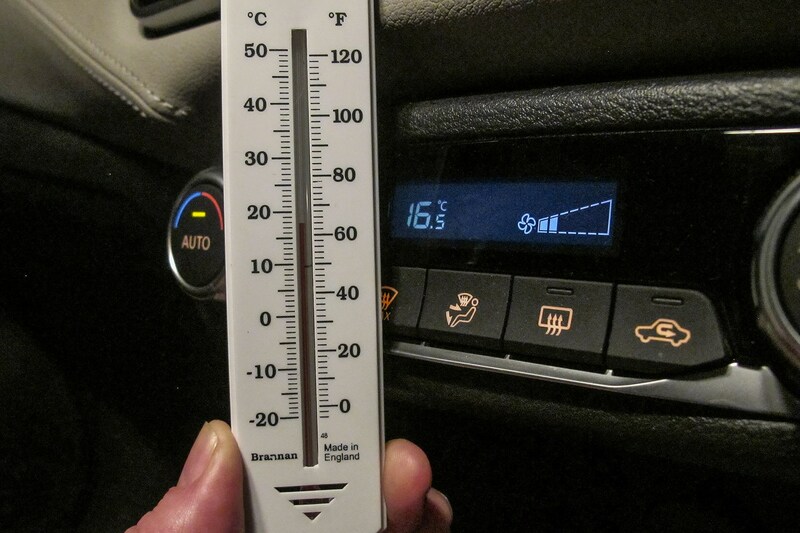 This brings me onto the second most common comment; ‘It’s either too cold or too hot when I’m in this car’. It’s true it can be hard to get a comfortable temperature. I find myself forever adjusting the controls by a few degrees back and forth and when I’m not heating the car and just using the air conditioning, the jump between a half a degrees seems extreme. That half a degree can sometimes be the difference in feeling cold to being uncomfortably hot. The Micra has just started a couple of weeks of relatively long distance commuting, around 120 miles a day. So far it is performing well. The car’s ride is a good compromise between firmness on the B roads and smoothness on the motorways. The only problem I’m encountering is self-inflicted. The Bose stereo is so good that it’s very tempting to pump up the volume and after 80 minutes of continuous driving it can leave your head ringing on arrival. 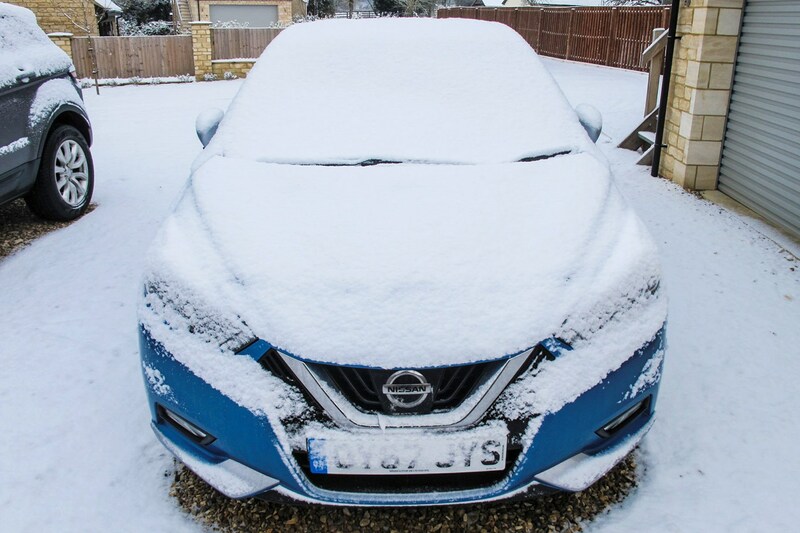 Our Nissan Micra Tekna has been busy undertaking all manner of journeys and tasks over the last couple of months, so it’s probably a good time to talk about the Nissan’s practical credentials. Let's talk about the boot first. On paper its 300-litre capacity is one of the best in class. While manufacturer volume figures can mean very little in the real world, the Micra’s boot is generous for a small car. It can easily devour the weekly supermarket shop for my family of four, the only downside being the high boot lip that makes swinging heavier items into place a little tricky - especially if you’re not blessed with height yourself. On occasion, I’ve folded the rear seats for extra space. It’s an easy one-handed operation that takes seconds. For even larger items the front seats fold back to an almost flat position. It means you can carry long, thin objects well over two metres in length. I’ve previously owned big executive cars that couldn’t do this. While we’re still talking about the boot I’ve got to mention the parcel shelf, which doesn’t clip into place but just rests on the hinges. I’ve lost track of the amount of times I’ve knocked the shelf off the mountings while loading and unloading. So far I’ve not had any passengers of sufficient height to challenge one criticism levelled at the Micra – the lack of rear headroom. Being just under six-foot tall, I decided to climb into the back to see for myself. There’s still plenty of clearance for someone of my size but it does feel a tad claustrophobic. Those beautifully tapered rear windows that give distinctive shoulders to the rear silhouette of the car also encroach into the upper rear cabin space. This means the top of the door frames to the side of me are just inches from my head and in my sightline, adding to that somewhat snug feeling. Rear legroom, as with a lot of cars of this size, is really dependent upon who’s sitting in front of you. For someone of my size, to be in a truly comfortable driving position I have to have my seat just one stop from fully extended. That means legroom is nonexistent for a passenger behind me. Even with one of my children sat behind me I have to move the seat forward enough that I feel as if I’m hunched over the steering wheel. With all that slick styling it’s no surprise that rear visibility isn’t that great. The back and rear windows are relatively small compared to other superminis. 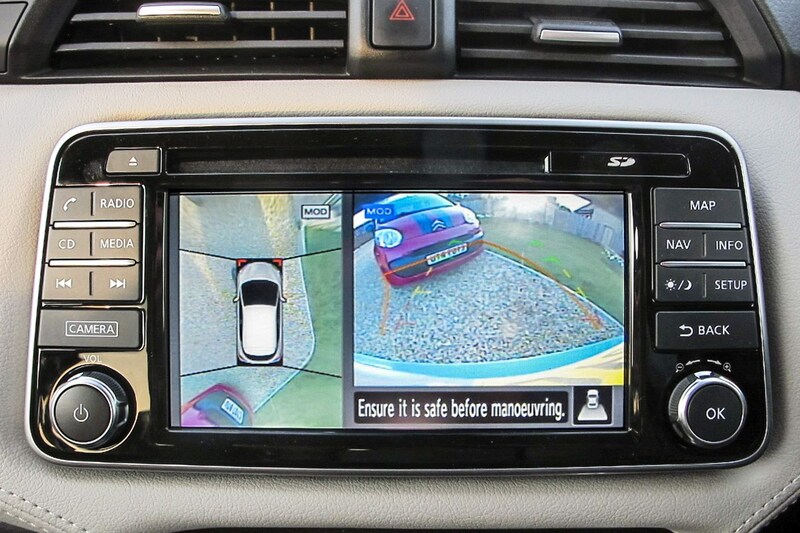 That would make parking a little more demanding but this Tekna grade car is equipped with a rear parking camera and as Nissan calls it an 'Intelligent Around View Monitor' as standard. Using cameras on each side the Micra cleverly composites an image of the car as if a drone is flying 20 feet above the Nissan and beaming back live footage. Both the rear camera and drone view are displayed simultaneously but it’s the view from above which I use all the time. Once you learn to trust the slightly surreal out-of-body images, parking really does becomes a doddle. The only drawback is that you’ve got to keep the cameras clean. After a couple of weeks' winter driving without a wipe the image resembles a badly tuned TV and you have to rely on the default of craning your neck. This feature is part of the Vision+ pack which is a £600 additional cost - It’s an option worth considering if you want to boost your parking confidence. Just over halfway through our time with the Micra, it’s time to look back at some of those first impressions and work out if anything’s changed. Early on in my stint with the Nissan I was impressed with the Micra’s motorway ability after the first long haul trip. It isn’t really designed for long journeys, but first impressions were that this small car has a big-car feel. Three months later and after some lengthy commutes, I’ve revised my opinion slightly. There’s less sound deadening than you’ll find in bigger cars to make motorway driving truly comfortable. Also, the seats have no adjustable lumbar support. After a weekend of landscape gardening my back was in such a state that I had to improvise with a cushion or risk never being able to climb out of the car again. The Blind Spot Warning and Lane Departure systems are still very useful, along with a much-used cruise control. Overall it’s a reasonable effort, but not the sector-busting performance I initially anticipated. My assessment of the ride has changed fractionally, too. After more than 7,000 miles the suspension is not as smooth as I first reported. It seems to have lost the edge from it’s excellent bump absorption, and more of the road surface can be felt through those lower profile tyres. To be fair to the Micra, it has taken a hammering from the glut of bone-crunching potholes around at the moment - enough to change any car's ride characteristics. The engine, on the other hand, has improved as the miles have been added. It feels free-revving and eager, especially at low revs. I have previously grumbled about the smoothness of the power delivery, but having finally mastered the occasionally unpredictable bite point on the clutch, the result is a very rapid car from a standing start - almost warm hatch territory until you hit higher revs. A very decent effort for what is only a 90hp car, and perfect for the Micra’s intended habitat around town. That’s not to say everything is now perfect. The Nissan will still occasionally give a very slight kangaroo hop when lifting-off the power, especially when still cold. It’s enough of a stutter that my wife will exaggerate her head movements as a cheeky criticism of my unsmooth driving. ‘It’s the car’ I say in reply, as she rolls her eyes. You may have noticed on these pages that the UK’s best selling supermini and Micra rival has recently joined the Parkers long-term test fleet. That’s right, the new Ford Fiesta is under the care of colleague Tom Goodlad for the next three months. I waited a few weeks for Tom to settle in with his new motor before I was badgering him for the keys. Now I have the car for a week to compare the rivals back to back. 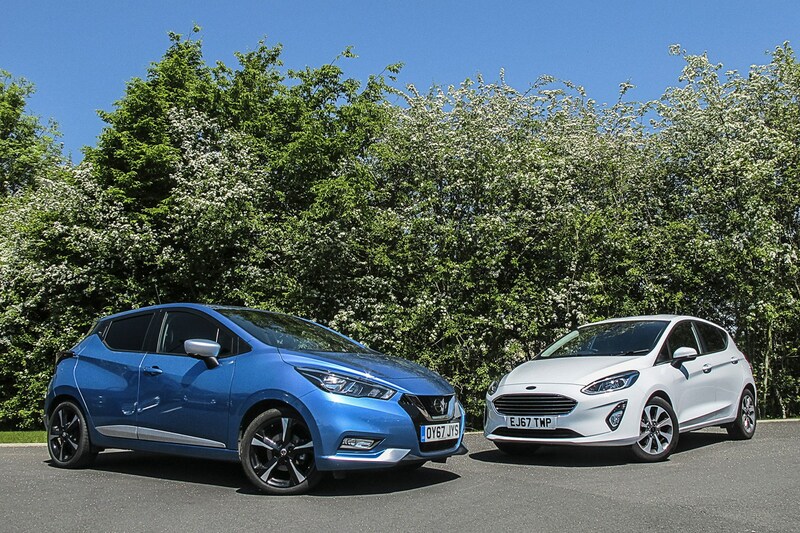 This might not be a direct comparison, as Tom’s Fiesta is very much a mid-spec Fiesta compared to our range-topping Micra Tekna, but when it comes to price the two cars are actually very close. Ford’s Titanium trim level and 125hp 1.0-litre EcoBoost engine is currently listed at £18,295 where the Micra Tekna grade on-the-road price is £18,090. We’ve both added some optional extras to our cars but they still work out to around similar values. 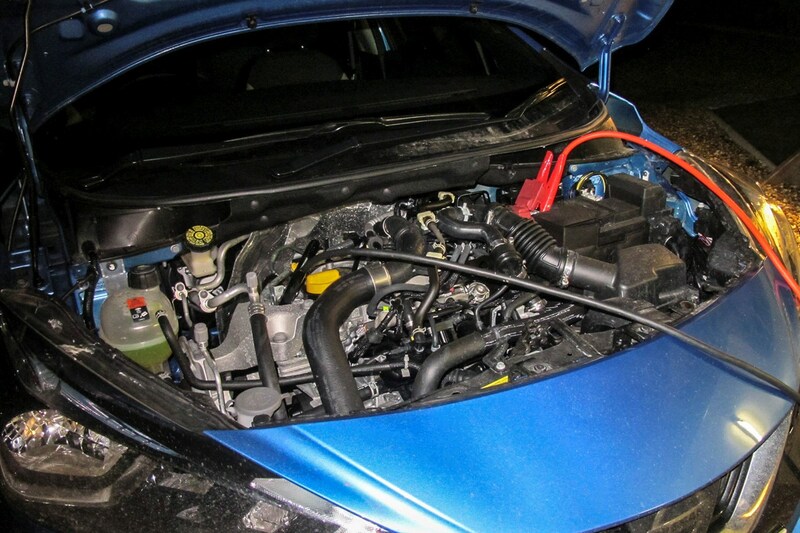 After firing up the Fiesta the first thing to hit me was how different the engines felt. On paper they are both very similar: both are turbocharged thre-cylinder petrol designs, but the Fiesta is more powerful. While the Micra’s punchiest petrol engine tops out at 90hp the Fiesta range starts at 70hp and climbs to 100hp, 125hp and 140hp. Tom’s Fiesta is equipped with the 125hp version, and it’s not only that extra power that makes the difference, it’s the way the performance is delivered. Where the Micra’s power is all dispatched - sometimes manically - at lower revs, the Fiesta’s extra go is more evenly spread across the rev range. It means I found it easier to pull away from a standing start, and more controllable and flexible when feathering the clutch. The extra horses really come into their own higher up the rev range when there’s a sweet surge of acceleration over 4,000rpm. In contrast, the Micra’s motor feels a little breathless as the revs build, after an initial zippy start. So in the engine stakes, while the Micra makes the most of its 90hp, the Fiesta comes out slightly on top with it’s wider range of engines and the flexibility they offer when driving. What was also apparent after the first roundabout in the Ford was the quality of the handling. I took the slightly longer way home across twisty B-road territory and the further I progressed, the more the Fiesta impressed with it’s cornering agility. It felt so composed on tighter corners, creating a greater feeling of confidence for the driver. It’s precise too, as I was able to make adjustments mid corner with ease. Usually when handling is this good, some of the ride quality is compromised - but with the Ford that’s not the case. For a small car, it felt serene and unflappable. 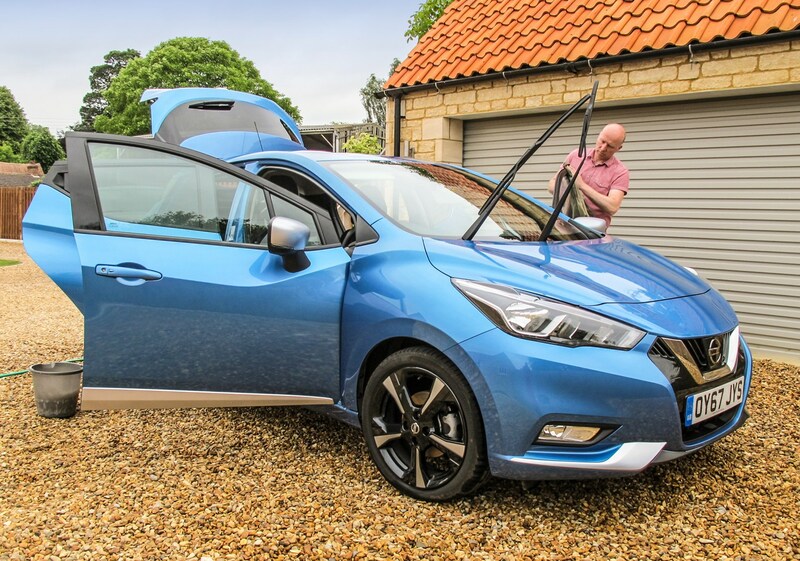 It’s a little unfair to give a direct comparison between both cars, as the Micra comes with bigger 17-inch wheels than the Fiesta’s 16-inch items. The Micra’s lower-profile tyres offer less isolation from the imperfections of the road surface. I’ll readily admit that I enjoy this kind of driving; I find it fun and engaging but I also realise I’m also in the minority. For most drivers both cars offer a good standard of handling and ride and few people will need to call on the Fiesta’s dynamic advantage. So my initial impression is the Fiesta is marginally ahead - but I’ve still the got the car for the rest of the week, and will take advantage of being able to experience both hatchbacks in greater depth. I’ve been borrowing colleague Tom Goodlad’s Ford Fiesta long-termer. It’s given me a chance to compare the Micra back to back with the UK’s best-selling supermini. In the previous update, my initial impression was that the Fiesta was ahead when it came to engines and handling. Since then, I’ve taken the Ford on a variety of journeys and got more of an in-depth feel for the car. 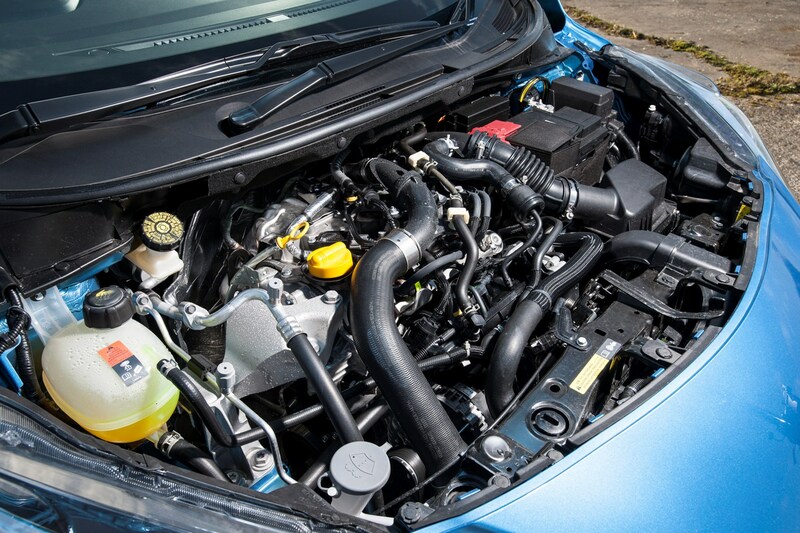 Tom’s Fiesta is equipped with the 125hp version of Ford’s three-cylinder engine. It offers a greater dose of grunt than the Micra’s 90hp unit, especially at mid to higher revs. Overtaking and manoeuvring between lanes is much easier as a result. 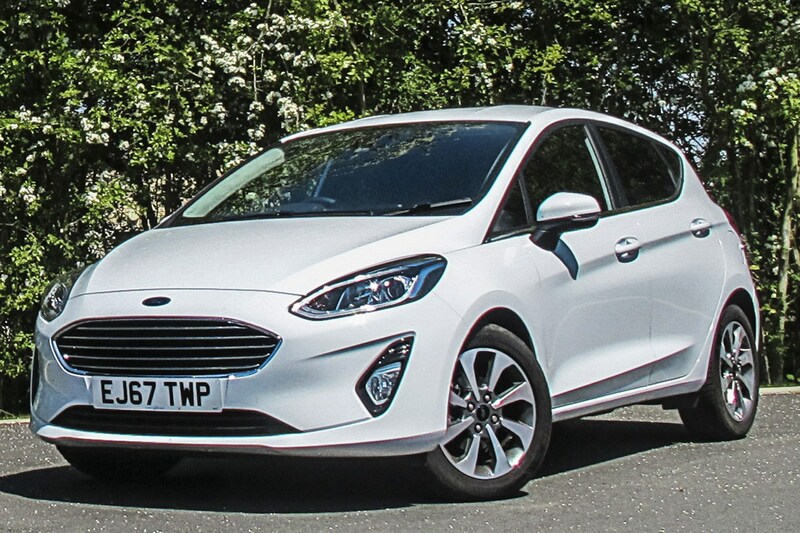 Progress is also reasonably relaxed in the Ford, as the Fiesta range with EcoBoost engines has a sixth gear to play with compared with the Micra’s five-speed gearbox. That extra gear makes motorway cruising much more relaxing and pleasurable. There’s also a greater level of general refinement. 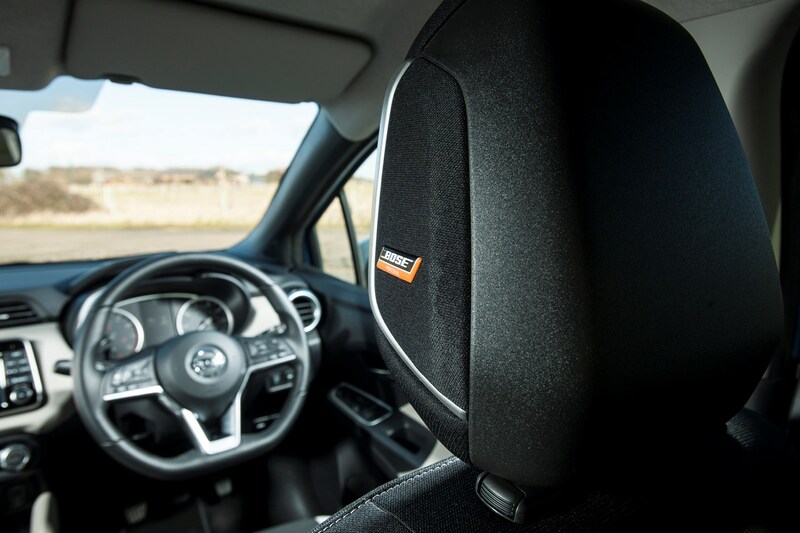 The Ford’s sound deadening is more effective than the Micra, making a conversation between passengers at a natural volume possible on the motorway. With the Micra you have to raise your voice slightly at cruising speeds - or the sound system has to go just a little louder than I’d like. It’s a small detail, but for someone who suffers from a little lower back pain the addition of adjustable lumber support makes a huge difference. It made my mid-distance motorway journey a real pleasure. 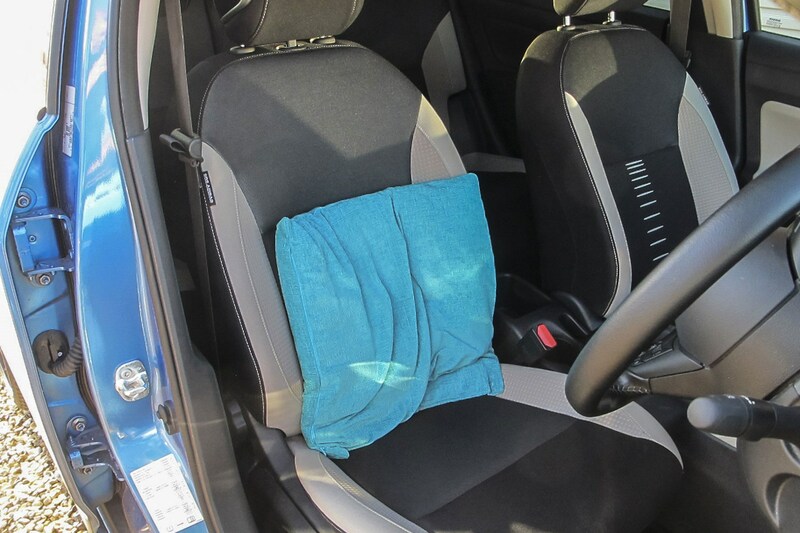 The Fiesta genuinely offers levels of comfort and refinement you’d expect in bigger, more expensive cars. So when it comes to driving dynamics and comfort, the Fiesta is definitely ahead. How much ahead depends what you look for in a car. If you like a sporty feel to a motor and are regularly completing lengthy journeys, it is miles ahead. If you prefer something more relaxed, it’s not so firm that the chassis is a deal-breaker, either. Inside, the interiors are very different in design. The Fiesta is busy and enclosed where the Micra is sparse and open. 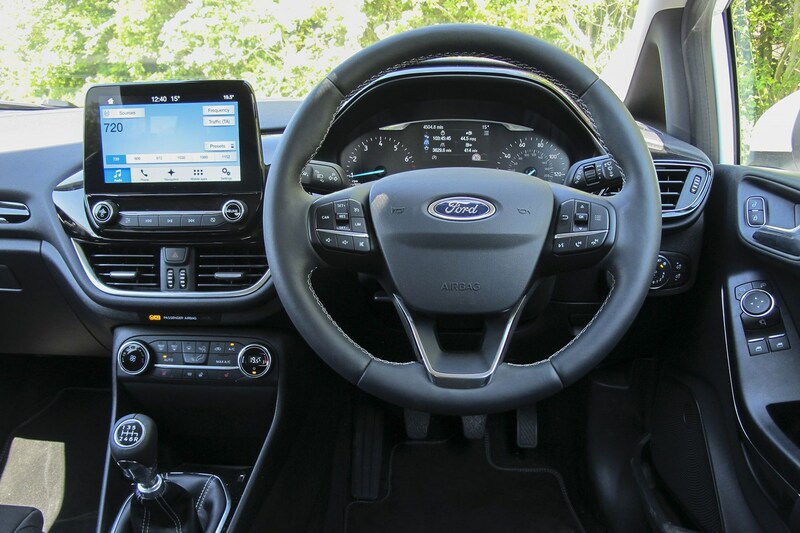 The Nissan feels more spacious, but I did like the Ford’s infotainment touchscreen, which sits higher on the dashboard. It’s easier for your eyes to flick from the road to the screen and back. Inside, the materials and build of both cars are of similar quality. Some nice leather-effect surfaces look great, but there are also some cheaper plasticky areas where the base model spec still shows through. Passenger space is a closer battle, and the Micra holds its own. 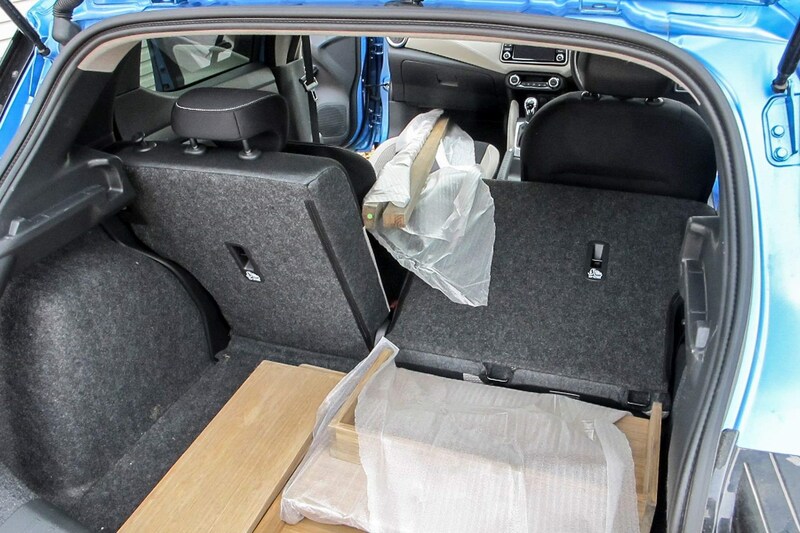 Although there’s a little bit more rear headroom in the Fiesta, both cars feel snug in the back because headroom to the side is limited by the top of the rear door frames, which encroach upon the interior space creating a feeling of confinement. So far, the Fiesta has won the majority of the head to head battles - but there is one major area I think the Micra will triumph with most potential buyers. Exterior appearance. 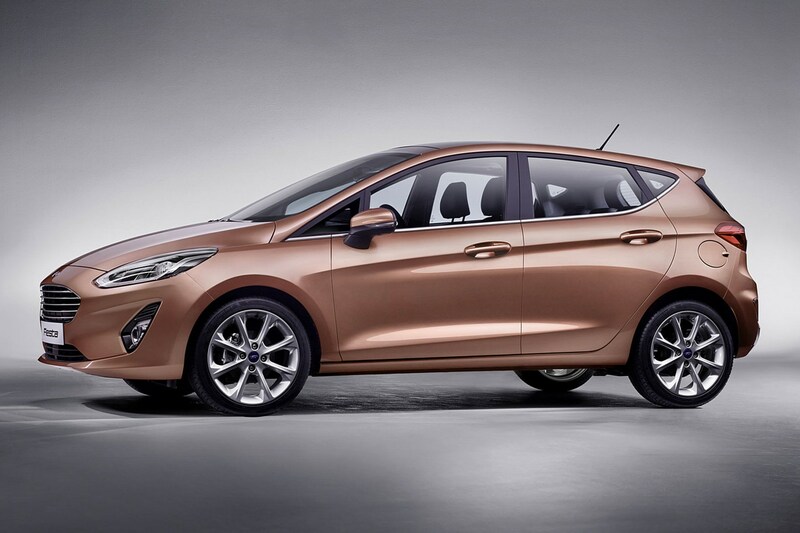 This is mainly thanks to the Fiesta’s safe, evolutionary appearance when it comes to design. Far from bold, it looks very similar to the old one, a shape that’s been around for almost a decade already. At a glance, I can barely spot the difference between a 2008 Fiesta and a 2018 Fiesta - I have to rely on details like the daytime running lights to help me out. Comparing the Micra and the Fiesta, the Ford does look a little conservative. That’s not to say the Micra is perfectly formed. There’s something of a squashed chipmunk’s face when I look at the Micra’s front end, but overall the Nissan looks svelte and cutting edge. It has an exciting new car feel about it, and just looks a little bit more special. The trim of the Micra inside and out looks to have a little bit more pizazz, too. A week with the Fiesta comes to an end, and I have to swap cars back, a thought occurs to me. Selfishly, If I had a choice, what keys would give back to Tom so I could keep my favourite car? It’s not an easy choice, but after some deliberation I decide that it would be the Micra, just. The Ford’s driving dynamics would win over the Nissan’s extra style in the end, for me, and I’d want to keep the Fiesta. For potential owners where handling ability isn’t as important, I’d imagine the result could be very close indeed. By far the most popular way to finance a new car today is by PCP (Personal Contract Purchase). So I thought I’d take a look at how good the finance deals are for the Nissan Micra, and how they shape up compared to the competition. I’ve scoured the manufacturer’s websites working out comparable deals and car specifications. It’s worth noting they are top line figures, once you walk into a dealer they may have better deals on offer or you might be able to negotiate a better contract. Read the Parkers guide to how to haggle on PCP car finance to make sure you get the best deal. If you’re in the market to finance a new Micra, the good news is that Nissan is offering very competitive numbers at the moment. 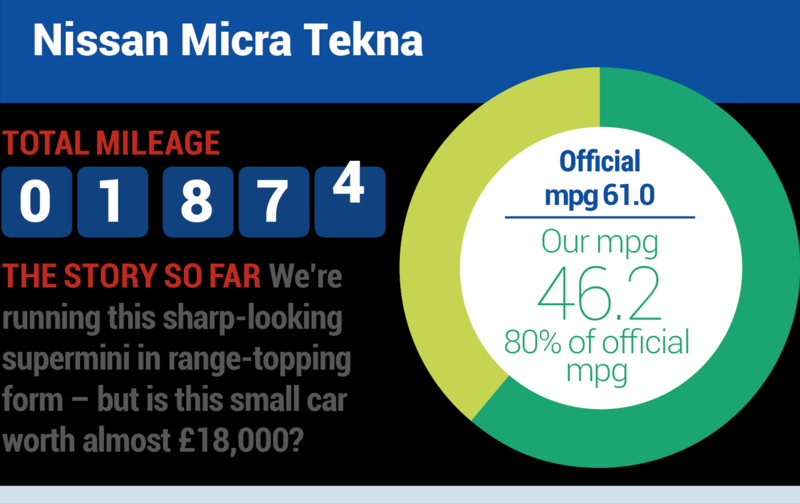 A Micra Tekna IG-T 90 similar to Parkers’ example would cost you £274* per month. That’s with a customer deposit of £1000, and over a period of three years with a 10,000 mile-per-year allowance. Nissan include a deposit contribution discount of £1500, and an APR of 3.5%. If you have a larger deposit - over £4,523 - Nissan are also offering 0% APR which sees the monthly payment fall to £186*. Nissan Micra finance - what about the competition? On the same three-year period, with a mileage allowance of 9,000 per year and customer deposit of £1000, a Ford Fiesta 1.0 EcoBoost 100hp Titanium X will set you back £290* a month with 0% APR. 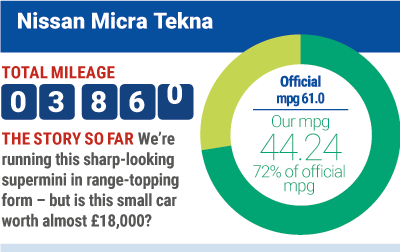 That specification is very close to the the Tekna grade, and costs £18,515 compared with the Micra’s £18,090. I preferred the Fiesta to drive when I tested them back to back, but the Micra’s rakish looks had the edge visually over the Fiesta. The VW Polo R-Line is a new trim level to the range, and prices start from £18,210 - very close to Tekna grade. It has the visual drama the Micra possesses. With the same contract details as the Nissan, the Polo R-Line 1.0 TSI 95hp would be £310* per month. That comes with £500 deposit contribution and higher APR of 6.3%. For around the same cash price as the 90hp Micra Tekna, the SEAT Ibiza allows far more power or luxury. For £17,935 the sporty FR is powered by a 148hp engine, which is a clear step up from the 90hp to 100hp trio explored above. With the same contract details, the SEAT’s monthly payment would be £273*. There’s a healthy deposit contribution discount of £1500, plus SEAT is currently adding an additional £500 if you take a test drive first, but APR is high at 6.2%. 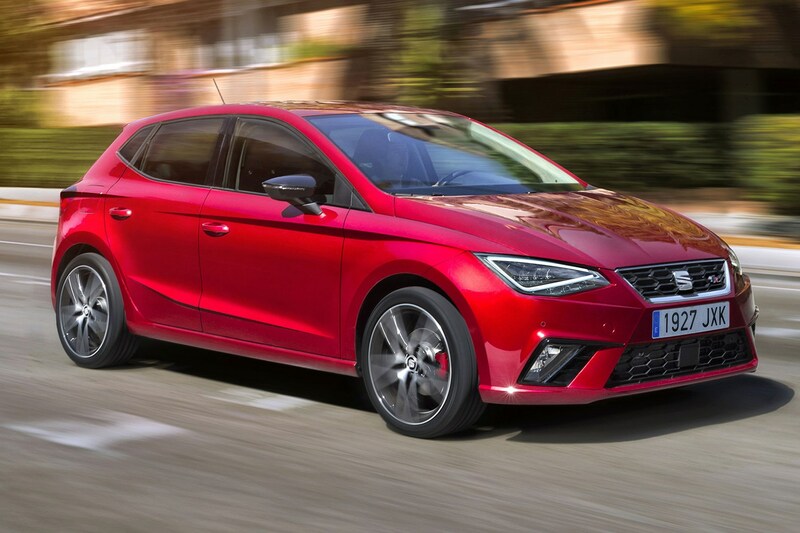 You can also consider the SEAT Ibiza 1.0 TSi 95hp Xcellence for a luxury feel, at £271 per month. This snapshot of prices proves the sector is very competitive, with not a huge difference in offers from the cheapest (the Micra) to the most expensive (the slightly more premium Polo). It may be worth test-driving as many rivals as you can and deciding which car is right for you first when prices are so similar. We’ve covered 10,000 miles in the Micra over six months and now it’s time to say goodbye. 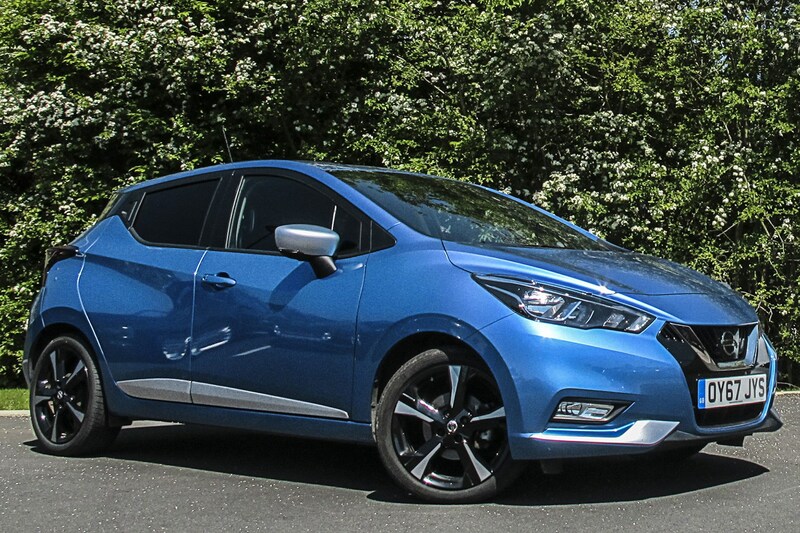 Has Nissan caught up with the competition with this reinvented supermini? The results are in and lets start with the positives. Nissan have gone for broke with the design of the Micra. Their design HQ is now based in London with the mission to produce cars with more appeal to the European market. We think it’s working, the swooping lines give the car a design flair that’s a step above the supposed emotive design of the Seat Ibiza. The Micra’s sleek silhouette is also bolder than the rather conservative Fiesta and Polo rivals. There are clever details like the rear door handles concealed in the window corners. That’s a neat solution to the growing trend of manufacturers – including Nissan – of only offering superminis in a less stylish five-door option. Nissan have also gone big on electronic safety features on the Micra. I’ve not turned any of them off during the duration of the test despite the extra beeping becoming occasionally annoying. On the whole they’ve worked very well. The Intelligent Emergency Braking system sometimes confused a traffic bollard for another car but only for a fleeting moment. Once or twice they prevented a near miss or something even more serious. I also think in general the features have made me a safer, more aware driver. The great news is the Intelligent Emergency Braking with Pedestrian Recognition and Intelligent Lane Intervention features are standard across the range. There’s only a single diesel and two petrol engines in the entire Micra range. That’s a very small selection compared with other rivals and means our top of the range Tekna grade car was only equipped with a 90hp petrol unit. Despite this low figure Nissan have engineered a really rapid feel to the engine. By combining a free flowing turbo and 3 cylinder layout the Micra packs a punch when accelerating from a stand still. You’ll be fooled into thinking it’s packing a much more powerful engine than it is, until it gets a little breathless at higher revs. Our Tekna grade came with oodles of options, some felt a little extravagant in a supermini but there is one feature that really stood out. The six-speaker Bose sound system with two units built into the headrest give a completely unique sound experience. This system is the first of it’s kind in any car let alone a supermini and gave my favourite music a truly immersive sound. If you’re a music fan I’d whole heartedly recommend this £500 option. That zippy engine is one the Micra’s strengths but is also a weakness. Balance the clutch right and the car is very quick away from the lights. With that pace you’ll be keeping up with city motorbike couriers for the first 20 metres or so but it’s very unforgiving. Feathering the clutch has to be extremely precise or your standing start gets very jerky and undignified. It took me a good few months to master the precision needed for smooth driving and even then it would still catch me out occasionally. The Micra got plenty of long distance use over it’s six month term but was found a little wanting in this department. Road noise gets quite loud over 50mph on the motorway. That posh sound system gets slightly drowned-out by the lack of adequate soundproofing and I found the seats uncomfortable after a long stint at the wheel. There’s also no adjustable lumber support to tailor a better fit to your own personal build. At nearly six foot the seats in general felt as if they were made for someone smaller. When I compared our Ford Fiesta long termer with the Micra the gap in long distance driving ability became very apparent. Better sound proofing, a more powerful engine, a sixth gear and more adjustable seats made the Fiesta a clear winner when it came to the motorway. Despite the new Micra dramatically increasing in size compared to the outgoing model it still feels a little snug in the back. Headroom is a little tight and the rear side windows encroach uncomfortably close to the rear passenger’s head giving a slightly claustrophic feeling. It’s the downside of those sleek design flourishes that make the Micra look so contemporary. A couple of minor design flaws saw the box-fresh Micra rapidly show signs of wear and tear. 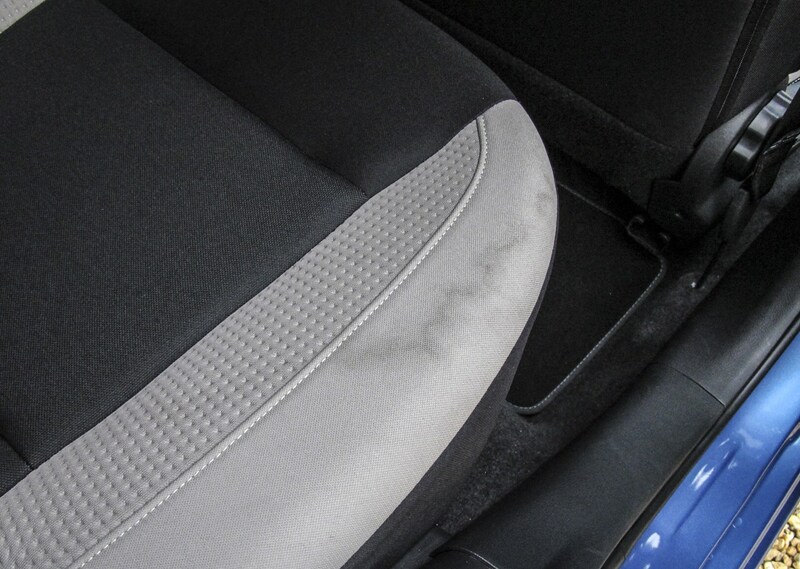 When opening the rear doors rain water dripped from the door frame and onto the cream coloured insets on the outer segments of the black seats. That quickly transpired into ugly water stains that would need a professional shampoo and dry to clear. Also the lip of the storage tray just between the gearstick and centre dash scratched too easily. It’s a perfect place to store your phone or keys and a harder plastic material or padded rim would’ve kept this prominent area looking buff. First impressions of the cars ride was mainly positive but over the course of the term the Micra took a real hammering from an unusually bad breakout of potholes. It left the Nissan’s ride feeling less taught and refined than at first and earned the Micra a middling mark for ride and comfort. 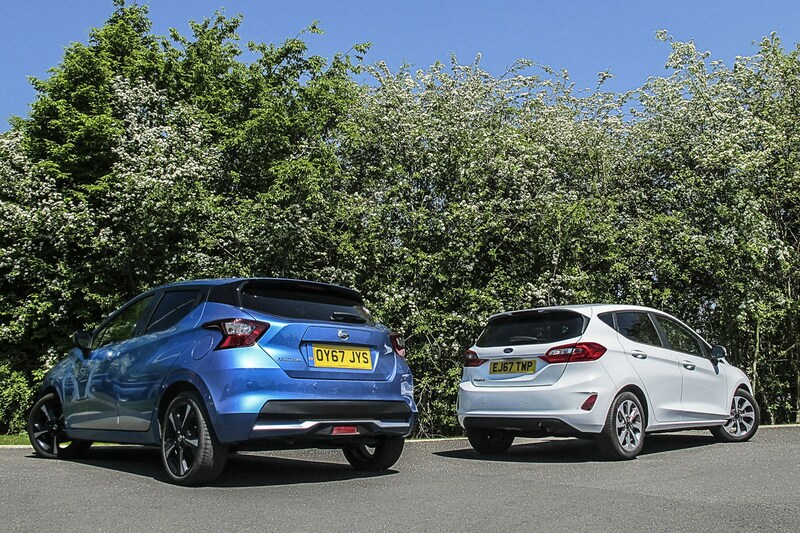 Handling too was neither bad nor great with the Fiesta again setting the standard in our back to back comparison. 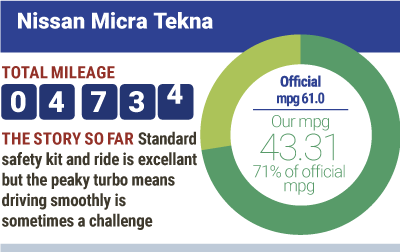 The Micra’s fuel economy is up there with it’s rivals. It’s slightly improved over the course of the test finishing with a perfectly respectful indicated MPG of 47.1 but according to my calculated records that drops slightly to 46.2. The quality of the cabin has it’s highs and lows. There’s some great stitched leather effect cream trim on our Tekna grade model that gave off a real premium feel. Equally there are some rough cheaper plastics carried over from more basic models. Overall the exuberant design of the exterior hasn’t really translated into the inside. It’s a no nonsense design with just the occasional interesting design detail. We can’t underestimate how much the new Micra has changed compared with the rather cheap and cheerful previous model. Nissan has catapulted the Micra into rightful contention with it’s ever improving rivals. But they’ve been clever not to go head to head with some of the rivals best qualities, instead Nissan has concentrated on offering a serious alternative to it’s more established equals. Modern looks combined with sharp performance and sophisticated safety features make it an ideal car for town driving. If that sounds like your perfect list of requirements when it comes to buying a supermini then add the Micra to the list of cars to seriously consider.